Another 2+ weeks to Chinese New Year! We have prepared three decorations using ang bao (red packet). Cut the ang bao as shown in the photo below. 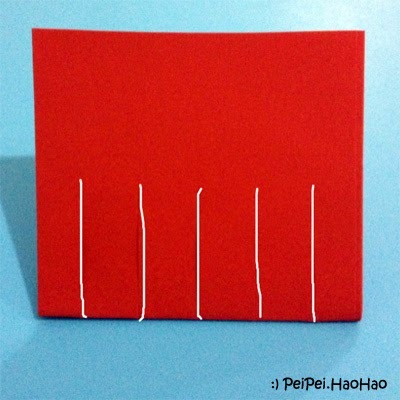 Fold the ang bao into half, cut the folded side along the white lines as shown below. Open up the ang bao, and fold the stripes outward. 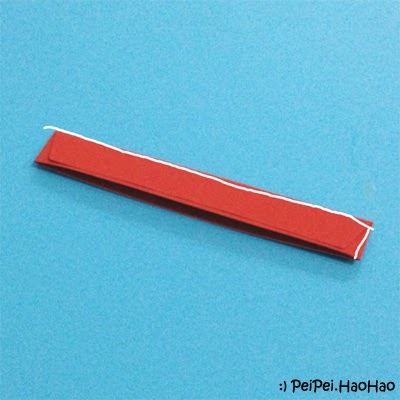 Don't throw away the sealed end of the ang bao that you have cut in Step 1! Cut it along the white lines shown in the photo, this will be the handle of the lantern. Paste both ends to the top of the lantern. Fold the ang bao into half lengthwise, write half of the Chinese character 春 (spring) so that it is symmetrical after you cut it out. Cut the ang bao along the edges, and cut it into 4 rectangles. Roll each rectangle, secure the ends using glue stick. Use tape to secure the rolls on raffia string. Have you started your preparation for Chinese New Year? Adding one more Chinese New Year ang bao craft idea - ang bao sheep / goat! Love the step-by-step instructions! Great post! Thank you Lisa! Hope you enjoy reading this post! I haven't, but I'm not Chinese! I was, however, in Bejing for the Chinese New Year five years ago and it was awesome! Good luck with your crafts. Thanks D.J.! Great that you enjoyed your stay in Beijing! Ooh, good to start doing this now, but I haven't had any time, let alone clean the house! Agy, there is still time, 2 more weeks!